At the annual product fair at work, I was introduced to another new line of snack foods, Funley's. They are all natural, use no preservatives, no corn syrup, no trans fats, etc. 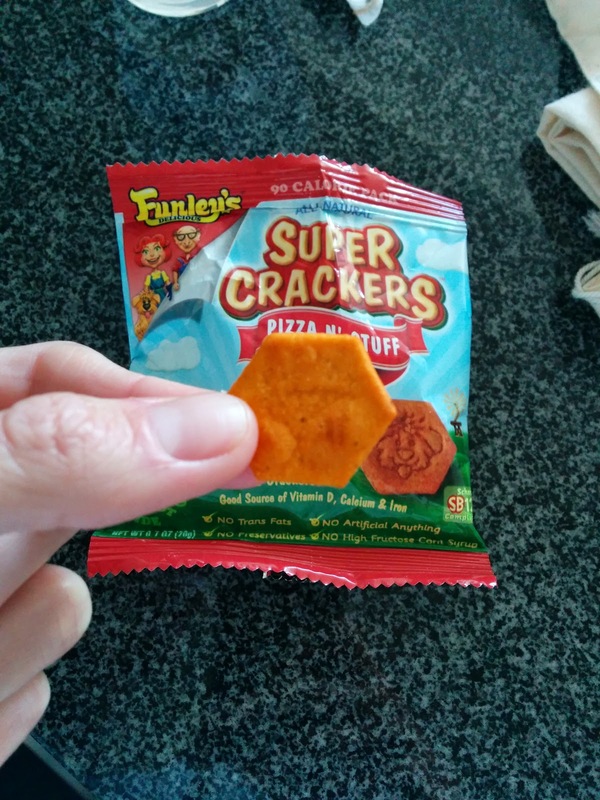 I'm pretty sure they are aimed at children, as one of their product lines is "Super Crackers" with hidden superfoods in them, to punk children into eating their broccoli, carrots, sweet potatoes, and spinach. They also make some different types of granola clusters, basically, finger food versions of granola. And some healthier chocolate treats, made with whole grain cookie bits in them. Of the items I tried, I really liked one of them, and found the rest to be generally ok. Nothing particularly amazing, but for being healthier snacks, they were decent. 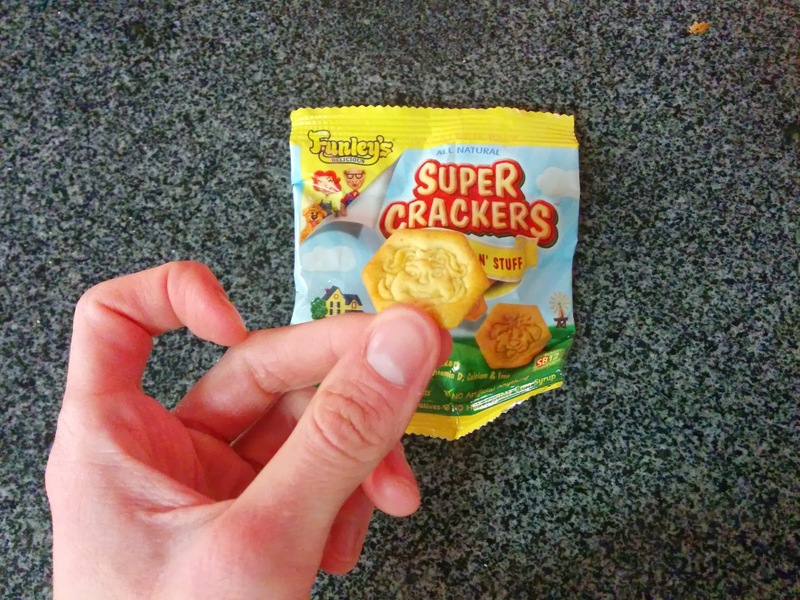 What makes a Super Cracker, super? They hide vegetables in them! Cornbread N' Stuff Super Crackers. "Cornbread crackers with hidden sweet potato". Tasting notes: These really do taste like cornbread! But ... as crackers! Interesting and pretty tasty. Don't taste the hidden sweet potato at all. "Pizza crackers with hidden carrot". These had a good crunch, subtle tomato flavor, but not really any cheese flavor, which I’d expect from a “pizza” snack. Meh. "Cheddar crackers with hidden broccoli". Tasting notes: Like Goldfish crackers, with subtle broccoli thing going on, not particularly great. If you really needed to get your kids eating broccoli, I could see how these would work. My least favorite of the products I tried. Perhaps not the most appealing name, but, Stix in the Mud is their "healthy" alternative to candy bars. Caramel Stix in the Mud. Tasting notes: Thin milk chocolate layer surrounding caramel, small amount of cookie bits in it. Very sweet. Would go well with coffee? 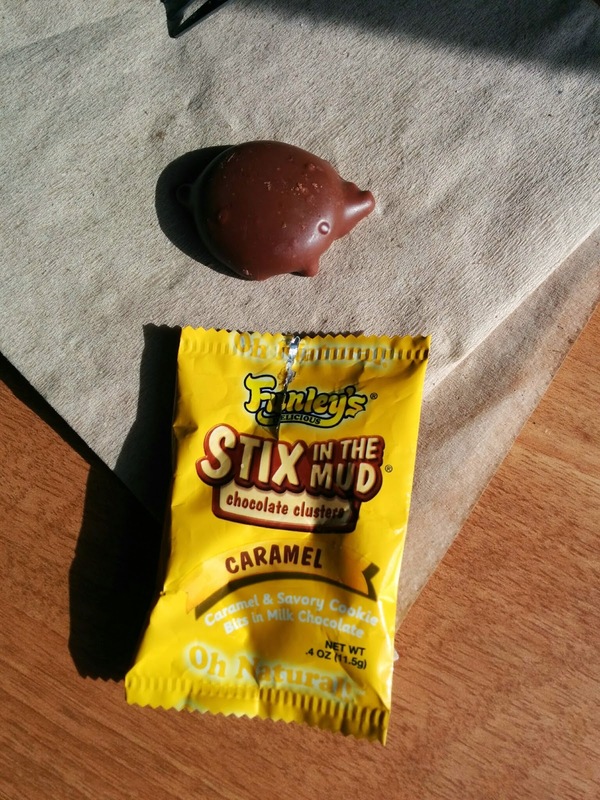 Update review: Mediocre chocolate surrounding mediocre caramel, little bits of cookie for some crunch. Totally mediocre all around. 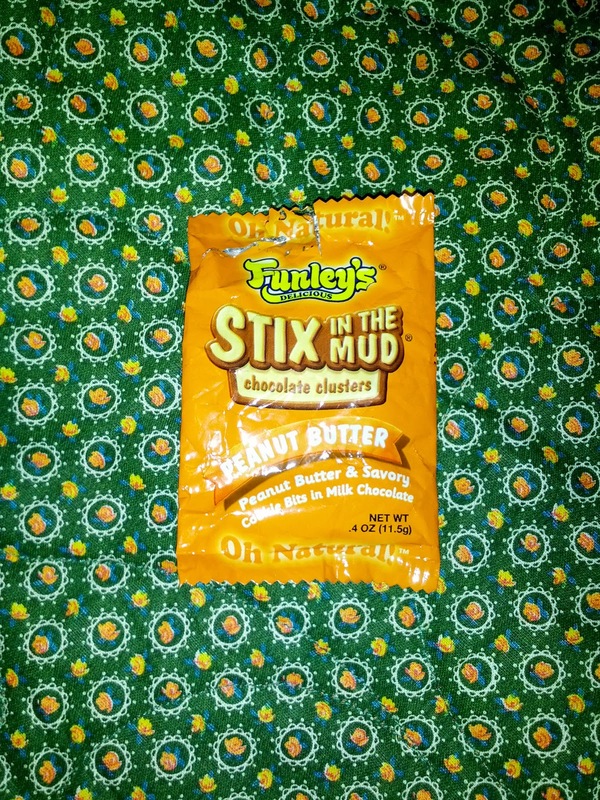 Peanut Butter Stix in the Mud. "Creamy natural peanut butter mixed with crunchy, savory whole grain flour cookie bits covered in pure milk chocolate". Tasting notes: Chocolate and peanut butter are always a winning combination, but this wasn't all that remarkable. Just sweetened peanut butter with a little crunch, some chocolate coating. And what is a Wholly Granolly Cluster? "A poppable, wholesome and crunchy granola snacks perfect for busy folks on the go! ", clearly! Peanut Butter Pretzel Wholly Granolly Clusters. 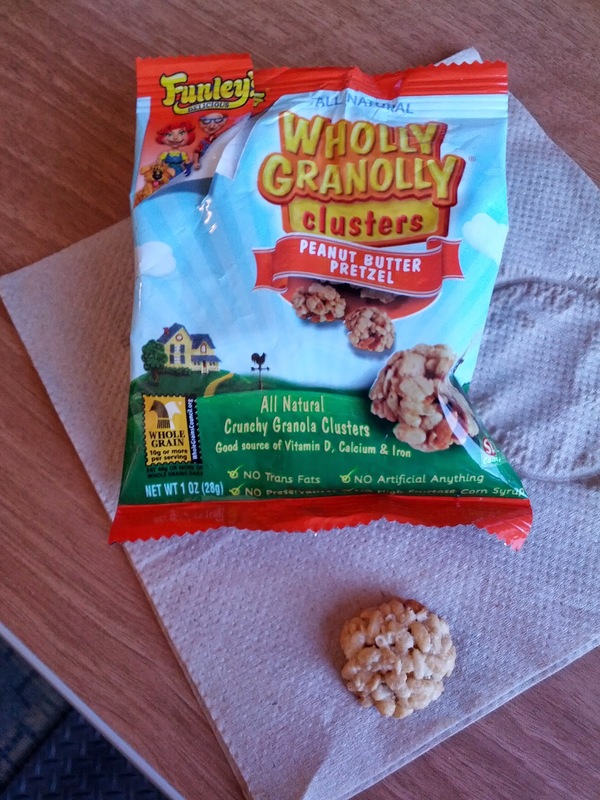 These are a fun idea, I like the crunchy snacky big clusters of granola, but I didn’t actually like these. Mostly puffed rice, not granola. Little bits of pretzel and some subtle peanut flavor. But, did not like. "Crunchy toasted oats, chocolate chips and fresh cocoa". When I first moved to San Francisco, I lived at 4th & Folsom. My roommate at the time, from whom I was renting a room, insisted that the neighborhood was on the brink of change. It turns out, he was totally right. Within a year, we had a handful of new restaurants on the street. Another year, we had Peet's right outside our door. Another year, and we got a real, neighborhood cafe: Epicenter Cafe. I visited it fairly often back then, grateful to have an independent coffee shop with a decent vibe close by. Then I moved away, and forgot all about it. Until one day recently, when I was at Whole Foods next door, and I was drawn back in to Epicenter because the sign out front proclaimed "homemade sweets and treats". You know how much I love sweets and treats, particularly baked goods. I eagerly walked up to the baked goods case, and peered in. I could see a scone, along with several types of muffins and croissants, but none were labelled, not with variety or price. The worker came over to ask what I'd like. I asked what the assorted baked goods were. He pointed at the scones and said "scones". No mention of what flavor it was. Very helpful. So I had to further ask, "what type of scone?" He said he didn't know. I think I glared at him at this point, so he filled in the details that usually they get sent blackberry, but this looked lighter in color than usual, so maybe it was raspberry. But he really wasn't sure. At this point, I asked where they sourced their baked goods from, and he said, Sandbox Bakery. I am familiar with Sandbox Bakery and do like their treats, but I was a bit put off by the sign proclaiming "homemade sweets and treats". I took that to mean that they made them there, at Epicenter. On my recent visits, I've only returned for the baked goods, so I can't comment on the rest of their food offerings, although all the signage boasts that it is organic, comes from local farmer's markets, the beef is grass fed, etc. The lunch and evening menu has the expected sandwiches and salads, along with a few more interesting dishes like mac and cheese, shepherd's pie, meatballs, and veggie curry. Breakfast has a few egg dishes, yogurt and granola, and bagels. And of course, they are proud of their coffee. The seating inside is very SOMA, with both tables and couches, where folks sprawl out to soak up the free wifi. I choose to sit outside on the sidewalk on each visit, at one of a handful of little tables. It is surprisingly peaceful out on the sidewalk, even though it really wasn't private at all. There was not a lot of foot traffic, despite the nearby Whole Foods, but just enough to not feel sketchy. And somehow, that little section of sidewalk gets morning sun. Perfect for enjoying a scone! The service has always been a bit unfriendly. I know I was asking a bunch of questions on my first visit, but even on subsequent visits I had the distinct feeling that I was bothering the folks working there by daring to enter their establishment and order something. If it wasn't for the convenient location, and the sunny sidewalk, I wouldn't be likely to return. There are plenty of other more friendly cafes in the city. On my first visit, I took a gamble and got the mystery scone. This was actually a really strange move on my part, as it looked fairly burnt. And I don't like blackberries (the seeds, they just bug me so much!) And, there was only one scone in the case, even though it was only 9:30am, which made me wonder if it was actually fresh that day. I generally feel that scones have about a 10 minute shelf life, and rarely like them, even when I get them at nice bakeries. There was really no reason for me to order the scone, except that I was really, really craving a scone. I had a scone the day before that really disappointed, so I was still feeling the need for a scone. Again, a crazy decision on my part, particularly because I like my scones warm, with jam and clotted cream. I knew this would have none of those elements. The moment the scone was in front of me, it was obvious that it was blackberry. Right in the center, a big blackberry. Seeds and all. I have no idea how the server didn't realize this was a blackberry scone. Now, as an aside, a story about blackberries, and why I hate them. I grew up with a huge blackberry bush in the yard. And I mean huge. When blackberry season hit, we had a LOT of berries. Sure, some of my dislike for blackberries might come from the fact that I had to help pick them, and if you've ever picked blackberries before, you know that this is an activity that is dangerous, if you value your skin. Those bushes are nasty. It doesn't matter how careful you are, they will get you. But, my real dislike of blackberries is entirely based on the seeds. I cannot stand them. They get stuck in my teeth. They are gritty. I want nothing to do with them. This is unfortunate, when you have an amazing blackberry patch in your yard, producing huge berries, which seem to have even more seeds than normal. Further unfortunate is the fact that my grandmother makes extraordinary blackberry pies. Well, if you like blackberries that is. Which everyone else does. So, all summer long, once berries come in, we would have fresh blackberry pie, all the time. This shouldn't have been a hardship, except that I could never stand the seeds. So I'd have warm pie, and eat the crust and juice, with plenty of ice cream on top, and pick around the berries. Or, if I was lucky, my grandmother would have a little extra pie crust and she'd make little tarts, filled just with simple jam, and I'd get one of those instead. Long story short, I've tried long and hard to like blackberries, but I just despise them. They are even worse in smoothies. Gritty little seeds in your drink? Ewww. Shutter. Back to my scone. My blackberry scone. My burnt looking blackberry scone. I still tried it, expecting to take a few bites, turn around, and go pick something else instead. But ... it was a million times better than it looked. The blackberry I predictably didn't like. But besides the one right on top, there was actually only one other berry in the entire scone. If I wanted this to be a blackberry scone, I would have been pretty upset with this fact, but as it was, this was a good thing for me. The berries were juicy, plump, and tart, but, they had seeds. Because, well, they are blackberries. And the scone itself was really dry and was a bit burnt, particularly on the outside edge. But inside, it was somehow perfectly moist. It had a tang to it, perhaps from buttermilk? I really liked the base flavor. It was sweet, with sugar crystals on top, but was not too cake-like, and the sweet complimented the tang well. It was a bit crumbly, but not too messy, as it was actually moist inside. Really, this was a very good scone base. If it had another type of berry, I probably would have loved it. I finished the scone easily, and think I would have enjoyed it even more if it were warm, or served with a little jam or clotted cream. And obviously, if it didn't have blackberries. But overall it was a winner, and I'd even be tempted to get one again, although I'd obviously prefer another flavor. $3.50 was a bit of a high price, although it was a large scone. I just happen to know that you can get them at Sandbox Bakery directly for $2, so, Epicenter is making quite a profit here. On my next visit, I had the choice of blackberry again, or strawberry. I clearly went for the strawberry. 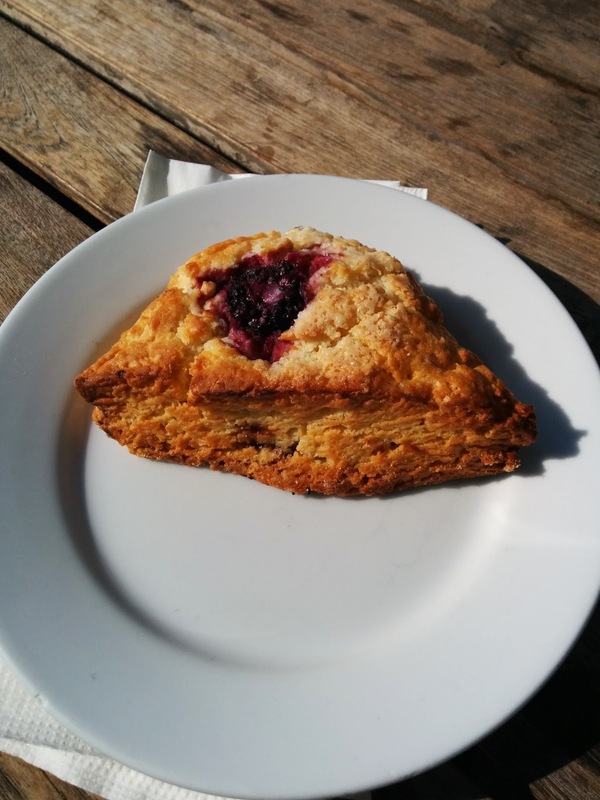 This scone was nearly identical to the blackberry. Same shape. Same burnt edges. Same pitiful amount of fruit. And ... I still really enjoyed it. 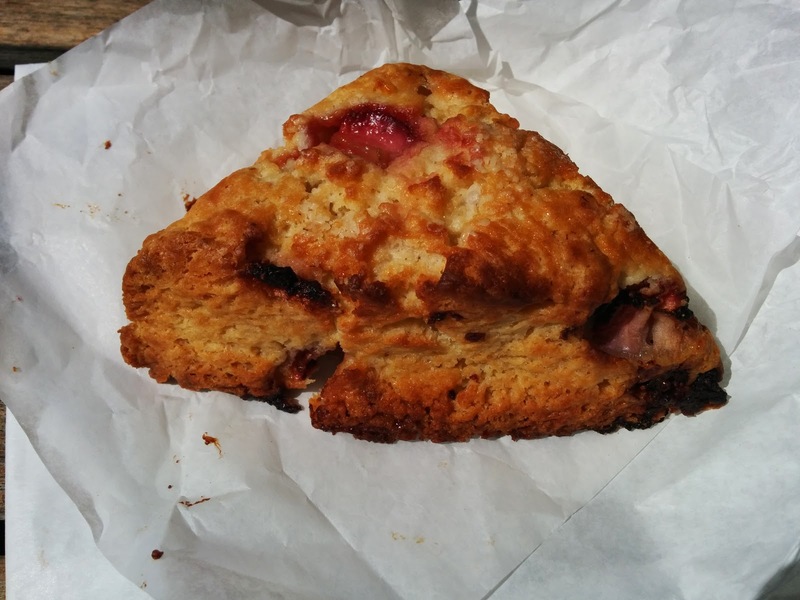 Sandbox Bakery gets a few things right about their scones, no matter what other criticisms I have. First, the texture. The scones look very dry, but are sorta moist inside, the real winning part being the way they crumble perfectly. They aren't too moist and cakey, but also aren't too dry. Texture wins here, even though the edges do wind up a tiny bit burnt. Second, the flavor of the base. As I mentioned, both the blackberry and strawberry scones had barely any fruit in them. In the case of the blackberry, I liked that, but, I really did want some strawberry. But, it didn't entirely matter, because the flavor of the base scone was just soo good. They have a fantastic tang. So yes, the scones are slightly burnt, have barely any fruit, and are only served at room temperature at Epicenter Cafe. But, I still like them. This time, I had half my scone at Epicenter, and kept thinking about how much better it would be with some jam (and even better, clotted cream! Can you tell I just spent time in London?). And about how much better it would be warm. So, I used some restraint, didn't finish it on the spot, and walked the 15 minutes home with the rest. It put it in the toaster oven for a few minutes to warm it up, slathered on my mom's homemade strawberry jam, and, I was a very happy girl. Thus, my protip: get a scone, from anywhere that carries Sandbox Bakery products. But bring it home to warm up, and serve with jam. Last time, my scone was $3.50, and there were no prices listed anywhere. This time, the price list showed $3.25, but I was charged $3. This is much better, as I did think before that the $3.50 price was a bit high compared with other coffee shops in the area. Wild Ophelia is a chocolate brand I had never heard of before writing this review. So I looked them up online. An American company, through and through. They use all American farms to source ingredients for their bars (not the cocoa obviously), with a focus on small farms and artisans, connecting local farmer's markets to chocolate. Of course, ingredients are organic, non-GMO, etc when possible. More interestingly, even the box that wraps their chocolate is made from recycled paper. Anyway, they make a variety of bars, either milk chocolate with 41-44% base, or dark chocolate with a 70% base. Each bar tells you where the ingredients are from and the varietal. The flavors are quite unique, like New Orleans chili (with cayenne! ), salted Chowchilla almond (Chowchilla is where the almonds are grown), southern hibiscus peach (using Bella Viva Orchards peaches, who I regularly see at my local farmer's market), Mount Sequoia granola, smokehouse bbq potato chips (yes, chips are in it), beef jerky (again, yes, with jerky), and a sweet cherry pecan bar. Given these unique flavors, it probably won't surprise you to learn that they are the sister company to Vosges, which certainly still has the most unique mix-ins to chocolate I've ever tried. I don't recall where I got the bar I tried, and I clearly didn't pick it out of their full lineup, as I certainly would have gone for one of the more interesting sounding varietals. I'll have to keep my eyes open in the future. Peanut Butter & Banana Bar. 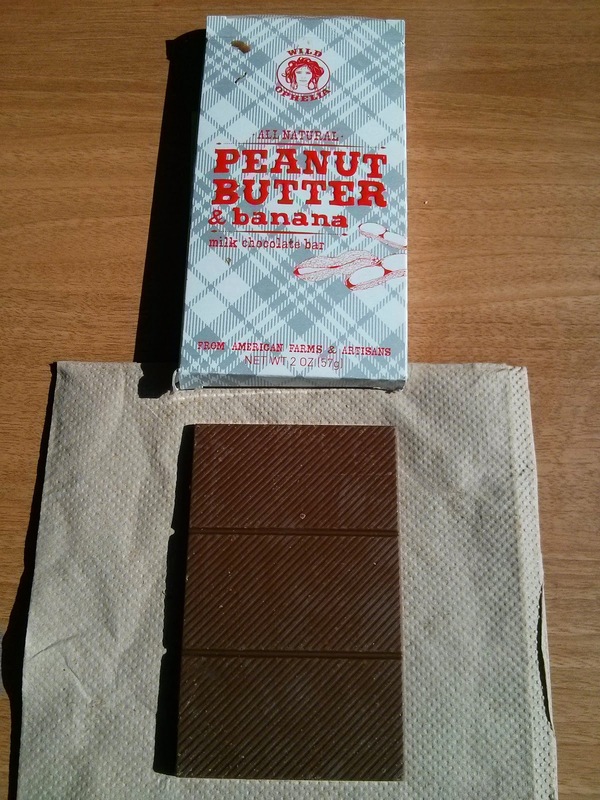 I had the peanut butter and banana bar, "Peanut Butter + Hawaiian Bananas + 41% cacao". The label provided further details. This bar contained Williams bananas from the "featured artisan" Uncle Mikey's Hawaiian Foods, located in Hanalei, Kauai. It promised a flavor profile of "a sweet, mild flavored banana with a honeyed smell, blended with roasted peanut butter and rich milk chocolate." It also told me many details about the soil the bananas grow in, how they are harvested, how they are dried, etc. I may have rolled my eyes a bit, but, honestly, it is quite cute how they are promoting the artisan's whose products they source. It sounded pretty good. I mean, peanut butter and banana are a great combo, peanut butter and chocolate are a great combo, so, why not combine them all together? I expected to see swirls of peanut butter, or chunks of banana, or ... something. Instead, it was just a smooth, mild milk chocolate bar. There was a tiny bit of grittiness, which I imagine came from ground peanuts. I did not taste any banana, but there was an underlying sweetness. It was fine, but not nearly as flavorful as I was hoping. A bit disappointing given how exciting it sounded.